Verdes is alive and well. So if you’ve come to this website and are over 65 or are friends with any Palos Verdes Seniors please be sure to spread this blog post to everyone who can benefit from understanding Medicare fraud in Palos Verdes issues. One good thing Palos Verdes seniors will appreciate is that the new cards will no longer use Social Security numbers. Instead, members will be identified by a unique, eleven-character ID composed of numbers and letters. The reasoning is sound. The old cards contained social security numbers and getting rid of those numbers should help reduce fraud. According to Medicare, the new cards will be sent automatically, so there’s no need to do a thing. Unfortunately, that’s the end of the good news. Everyone 65 or older, roughly 60 million people, have Medicare. Your insurance may be provided via a Medicare Advantage plan, or you may have a supplemental plan, but the bottom line is if you’re over 65, you’re in what is called the “Medicare market.” Because it would be nearly impossible to ship out all those new cards at once, the switch will take place over the course of one year. With a target market of 60 million people, many with some form of cognitive impairment, and more than a year to run their scams, is it any wonder scammers are salivating over the potential windfall? Even seniors without a cognitive impairment risk falling into the trap of following the lessons we were taught early in life—be trusting, be polite. Both lessons are tools scammers can use to their advantage. Tip 1: Medicare will never call, email or text you to ask for your personal information. This means that if you receive a communication asking for your information, it’s a scam. Tip 2: The new cards cost nothing. If you’re asked to pay a fee to expedite or process shipment of your new card, it’s a scam. Tip 3: Medicare will also not contact you via phone, email, or text to discuss your “new benefits” or find out if you’ve received your new card. If they do, it’s a scam. 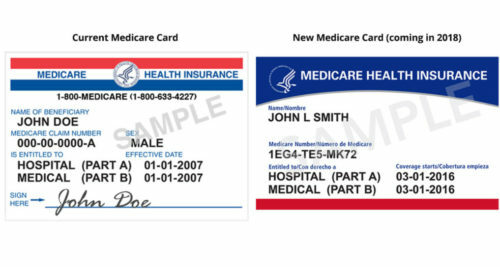 Medicare benefits are not changing just because new cards are being sent out. Tip 4: If someone calls, emails, or texts you and claims your Medicare benefits are in danger of being cancelled unless you pay a fee or share your information, it’s a scam. Tip 5: Medicare does not accept payment in the form of gift cards, wired money, or credit card. If someone asks you to send them money, it’s a scam!